Has the Battery got a Drain? Does it go flat when left overnight? If so it may have a drain this can be caused by many things, the boot light could be staying on, an electric aerial trying to always go up or down, an electric fan may not be shutting off, heated mirrors staying on etc. Normally if the battery voltage is less than 10.5v in the morning you have got a drain. The simplest way to check for this (without any meters) is to disconnect the negative (-) battery terminal and see if it still goes flat overnight. 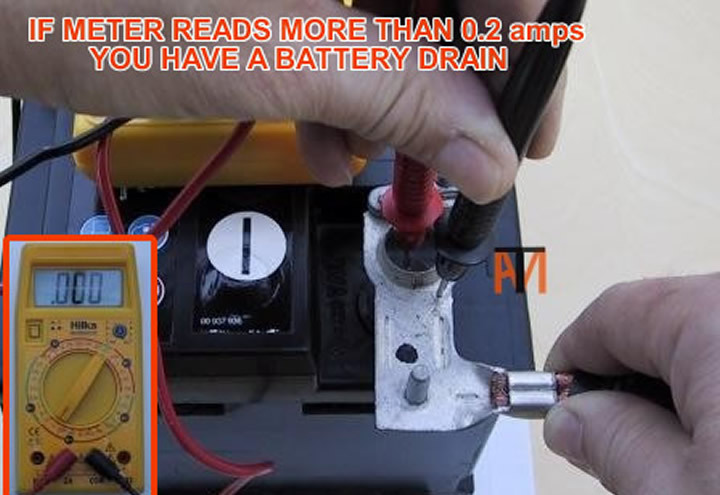 The best way to check for a drain is with a non-contact inductive current clamp (if you buy one make sure it reads DC volts) this will pick up the current drain without disconnecting any leads. You don’t want to see more than 0.2 amp maximum current drain on the main battery leads. Make sure doors etc. are shut when testing. If you find a drain check boot light (about 0.5 amp) etc. if hatch back, tip the rear seat forward to see if the boot light goes out, if saloon and you don’t want to lock somebody in the boot to see if the light goes out, set your mobile phone to video and film inside the boot when you close it, the film should go black in the middle when the boot shuts and light goes out. If the drain cannot be found easily, try removing one fuse at a time, when the drain stops see what is listed on that fuse and go to that component, if more than one is listed you may have to disconnect each component one at a time to find drain or check to see if the motor is hot, on an electric aerial for example. You could also use the current clamp on the wires to each component. 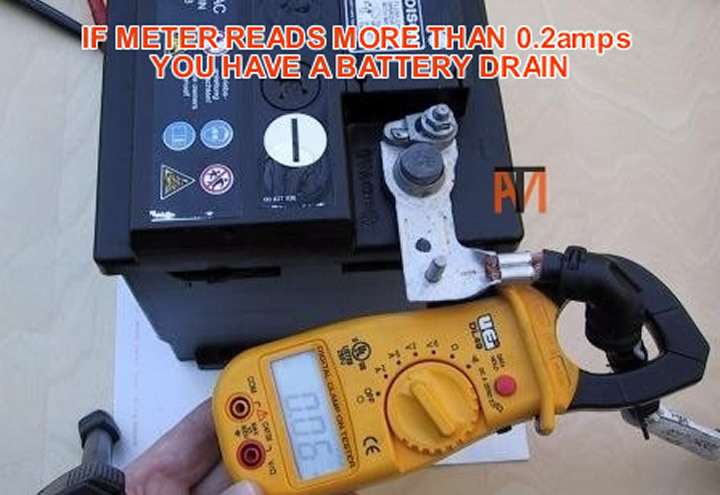 You can also check for drain with a multi-meter that reads DC amps, you will need to connect it in series, between the negative (-) battery terminal and the negative (-) battery post (see picture) . You don’t want to see more than 0.2amps. If you see no reading on the meter, check you have not blown the internal fuse in the meter by opening the door and putting interior light on (should read about 0.5amp). If you connect the meter to the lead and battery first and then pull the terminal up the probe (see picture), you won’t lose radio code and clock time etc. 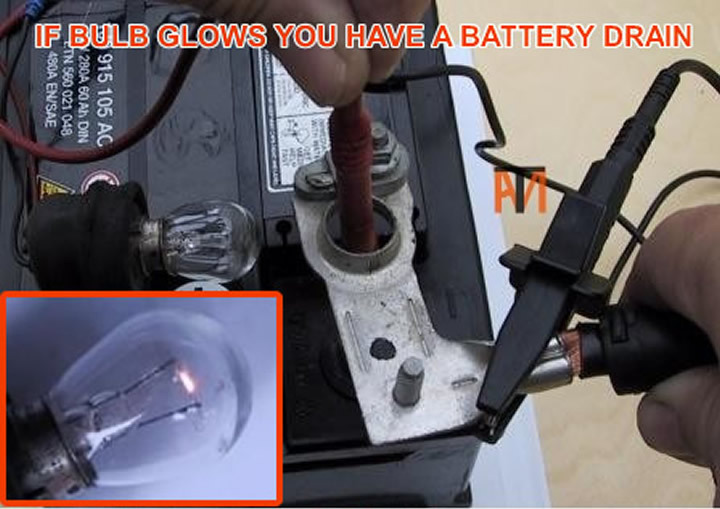 You can also check for drain with a 12v 21w bulb, you will need to connect it in series, between the negative (-) battery terminal and the negative (-) battery post, see picture of how to use, you need remove the terminal after you have connected the bulb so the car is always connected, otherwise the central locking etc. can try to pull current though the bulb when you connect. The filament of the bulb should not glow at all if it does there is current being drawn. I still sometimes use this method myself as it is a visual and sometimes easier to see than a meter. If you see in the picture below I connect the crocodile clip to the lead and then pull the terminal up the probe picture above, so everything like central locking has settled down and won’t mislead me by trying to pull current. 5.Battery Flat can't get out of Park or Garage?